DCode GU is a student-run organization that promotes computer science education by providing tutoring and mentoring for local grade school and high school students at local DC schools. Their goal is to make computer science education both accessible and approachable by bringing exciting lesson plans and molding the curriculum to fit specific student needs. 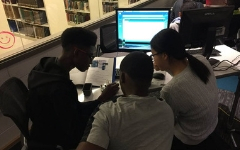 The team visits Washington Jesuit Academy and HD Woodson High School several times per week to teach Scratch, Python, and Java programming languages. This fall DCode GU will continue their work in the Maker Hub to build out their curriculum, developing additional hands-on projects for students. They will also work to expand their team and tutoring base to reach more students in the DC area and to foster a sense of community for computer science students at Georgetown.